Do you love your deck but sometimes feel it’s more hassle than it’s worth? Would you like to find a way to make it more enjoyable while cutting down on all the maintenance? Then artificial grass may be the solution you are looking for! When it comes to refreshing your outdoor space, artificial grass on decking may not have been something you’ve thought of. But it has many surprising benefits that make it something worth considering. To show you how it can transform your deck, let’s look at 5 benefits of laying artificial grass on decking. Over time, your deck will begin to show it’s wear and tear. Splinters and rough areas become a common occurrence. You may even notice the wood chipping away in areas of high traffic. And you can imagine how uncomfortable that is to walk on. But artificial grass makes that all go away. Instead, you will have a soft, lush, comfortable area to walk on. You’ll enjoy no longer having to wear shoes just to walk outside onto your deck. We all know the Phoenix sun can be relentless. Baking the surface of our decks on a daily basis. And that hot surface can burn your feet. Artificial grass on decking protects your family from having to walk on a dangerously hot surface. It also keeps your family safe from slipping when it gets wet. Pools and outdoor water activities will turn a deck into a slippery surface. 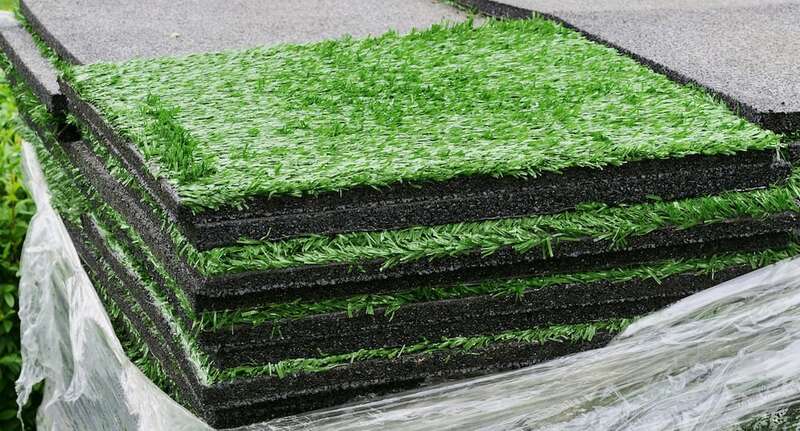 But artificial grass drains easily and prevents any slipping hazards. If you’ve got a pool near your deck, artificial grass can help you keep it cleaner. Dirt and debris not only fall into pools from wind and other natural causes, but feet carry more into your pool than you may think. Artificial grass will capture most of the dirt and debris before it gets tracked into your pool. And that will save your pool filter from working overtime and cut down in the amount of time you spend maintaining your pool. Say goodbye to the days of power-washing, staining, painting, and sealing your deck. Artificial grass on decking is not that fussy. All that’s required to maintain your artificial grass surface is the occasional hosing off. And if leaves or other debris from your yard falls onto it, it’s nothing a leaf blower can’t fix. So instead of spending time constantly caring for your deck, you can spend your time enjoying it. Maybe you have a small yard with no grass. Or perhaps you live in an apartment with only a deck or balcony for outdoor space. Even so, that doesn’t mean you can’t enjoy the beauty and benefits of having your very own grassy area. Covering a deck with artificial grass gives you an instant green space. It transforms the look of your yard and your deck. And it gives you an area for entertaining and relax that feels more like the great outdoors you enjoy. Transforming your outdoor space is as easy as installing artificial grass on decking. Your family will enjoy the added comfort and safety, while you’ll enjoy the low maintenance of it all. Ready to get started on your deck transformation? Contact us today!